The evolution of the Aral Sea, which is one of the youngest inland water bodies in Central Asia, is closely related to the development of the rivers of the Turanian plain. Although tectonic subsidence in the modern Aral basin had already occurred in the late Pliocene, as indicated by lacustrine and marine sediments, there is no evidence indicating the presence of a water body in the early and late Pleistocene. Analysis of the drainage network pattern has shown that in the early and the middle Pleistocene tributaries of the Amudarya formed alluvial plains in the place of the Aral Sea (Gerasimov, 1937). The modern water body formed in the late Pleistocene after the Amudarya had turned north (Fedorovich, 1975). Since then the water level in the Aral Sea has been fluctuating. It has been established that during the late Pleistocene termination its stand was high, about 70 m a.s.l. 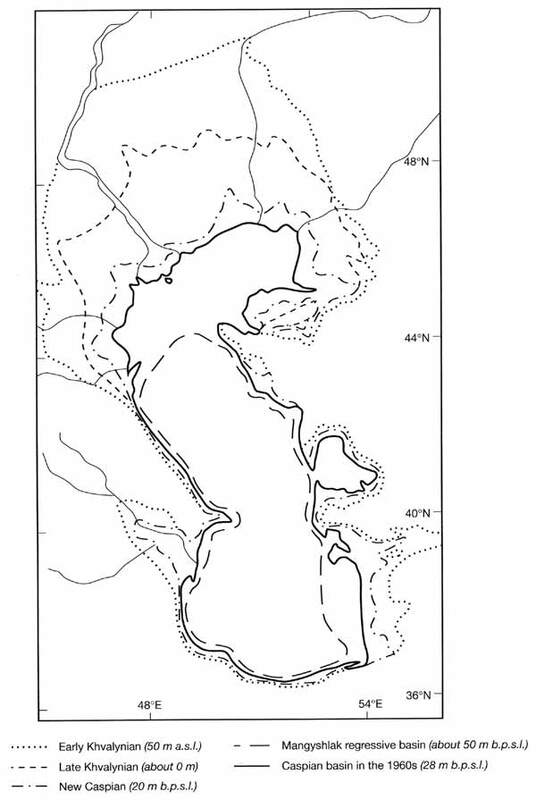 (Serebryanny et al., 1980) although the size of the basin is still unknown. When the Amudarya discharged through the Uzboy into the Caspian Sea, the level in the Aral dropped and water remained only in the deepest parts. A highly mineralized layer of bottom sediments dated to the early Holocene confirms such an episode. Later, several high stands occurred, as indicated by a series of terraces located at approximately 58 m a.s.l. One of the high phases corresponded to the wetter conditions of the Lyavlyakan pluvial interval, which occurred about 6500-4500 years BP (Vinogradov and Mamedov, 1975). The latest transgression of the Aral Sea occurred about 3000 years BP. The recent history of the sea has been controlled not only by climatic fluctuations but also by the development of large-scale irrigation (see below). The recent decades were marked by the catastrophic shrinking of the Aral and its level dropped by 13 m between 1960 and 1994. The evolution of the Caspian Sea has been linked to the history of the East European plain since the Caspian depression formed in the Pliocene. Tectonic subsidence resulted in the enormous Akchagylian transgression during which the sea completely covered the Caspian lowland and ingressed far into the Volga valley which had been deeply incised during the preceding uplift. The beginning of the Quaternary was marked by the Apsheronian transgression; this occupied most of the lowland although it was less extensive than the previous one (Meshcheryakov and Aseev, 1974). The Apsheronian terraces occur at 60-80 m a.s.l. A prolonged stand of the brackish-water basin at such a relatively high level can be explained not only by the general subsidence of the depression but also by a wetter climate, as indicated by the widespread fluvial and lacustrine sediments, which occur outside the limits of the transgression. In the early Pleistocene, as subsidence continued, the lowland was covered by the shallow Baku marine basin which left sands and clays with characteristic marine fauna within the area limited by the 0 m contour. In the north, the sea penetrated into the linear tectonic depressions, which at present are occupied by shallow saline lakes and playas. The retreat of the Baku basin at the second half of the early Pleistocene was probably related to the uplift in the north of the Caspian depression. This uplift also resulted in the incision of the Volga and other rivers down to 60-70 m below their modern channels. In the middle Pleistocene, renewed subsidence caused the Khazarian transgression, which proceeded through most of the middle Pleistocene and the beginning of the late Pleistocene and at its maximum stage probably reached 15-20 m a.s.l. 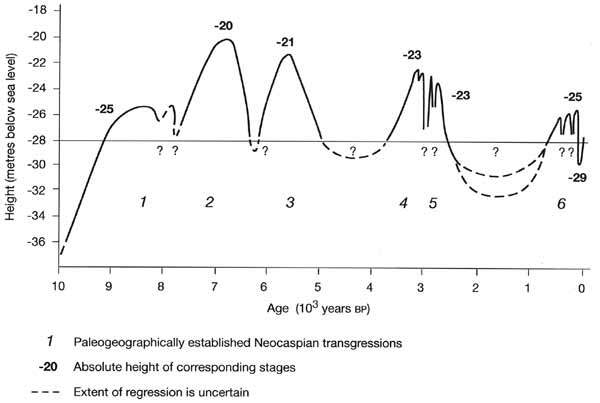 Several phases are distinguished in this transgression but there is no consensus on their precise chronostratigraphic position (Rychagov, 1997a). Distinct was the late Khazar phase with the Caspian level at about 10 m or 15 m below the present sea level (b.p.s.l.). At least partly, it belonged to the late Pleistocene (Chepalyga, 1984) and correlates with the Karangatian transgression of the Black Sea and the first late Pleistocene Mikulino-Eemian interglacial (Table 2.1). The latter hypothesis is supported by the abundance of warm-loving molluscan fauna and pollen data, which indicates that rich herb and grass steppes existed in the Caspian lowland at that time. The final stages of the late Khazar phase were marked by increasing salinity, which points to a more arid climate. The sea level dropped to the lowest position in the Quaternary of about 120-140 m b.p.s.l. (Rychagov, 1997я). The subsequent early Khvalynian transgression was the most extensive in the Pleistocene. The sea level rose to about 75 m above the present one and reached the 50 m contour (Figure 2.7). This transgression is attributed to a colder climate and reduced evaporation losses. According to Chepalyga (1984), water input exceeded losses by at least 12 km3. The surplus could be discharged through the Manych Strait into the Black Sea. The Caspian—Black Sea connection was one-way and existed for a short period of time as no water freshening in the Black Sea occurred. The next transgressive late Khvalynian stage (separated from the previous high stands by a drop of the sea level to 50 m b.p.s.l.) formed an expansive marine plain bounded by the 0 m contour, as indicated by the ancient beach barriers and river deltas which exist locally. Recently obtained data indicate that the late Khvalynian maximum occurred at the end of the late Pleistocene. Rychagov (1997b) placed it around 16 Ka BP, which is later than the maximum expansion of the late Valday ice sheet and the lowest stand of the Black Sea. However, the existing data are insufficient and there is still no agreement on this issue. The late Khvalynian basin retreated rapidly and only the largest rivers retained their courses using the ancient drowned valleys (Meshcheryakov and Aseev, 1974). Small rivers formed dry deltas or discharged into the closed depressions. The lowest sea level (the Manghyshlak regressive phase; about 50 m b.p.s.l.) occurred at the very beginning of the Holocene at approximately 10 Ka BP (Figure 2.8). It was followed by the latest New Caspian transgression which reached a maximum of 20 m b.p.s.l. about 7 Ka BP (Figure 2.7). The subsequent period was characterized by repeated fluctuations of sea level. However, during the last 2000-2500 years the Caspian level has never surpassed the 25 m b.p.s.l. mark. Rychagov (1997b) argues that the water balance of the Caspian during the last two millennia is typical of the present stage and predicts that it would not rise above 25 m b.p.s.l. in the near future. The fluctuations of the Caspian in the last few decades are a matter of concern (see below). The sea level, which remained at about 25m b.p.s.l. throughout the nineteenth century, dropped to 27.94 m between 1929 and 1941, remained at this point until 1955 and decreased to 29.02 m in 1977, when it reached the lowest level in historical times. For the first time the drop in water level was not forced by climatic fluctuations alone but also by human activities such as reservoir construction and irrigation (Leontyev, 1985). In 1977, the Caspian level began to rise (see below). However, it is expected that this increase will gradually slow down and possibly stop at about 26 m b.p.s.l. (Rychagov, 19976) when water spreads across the vast areas of coastal solonchaks and evaporation losses increase.